When Marlene Haley moved back to Ottawa after living in the U.S., she brought back a love of frozen custard and food trucks. When she noticed a sweet frosty void in her West Wellington neighbourhood, the idea for the Merry Dairy frozen custard truck was born. What is frozen custard, anyway? Well, I’m glad you asked. The first time I heard the term “frozen custard” it was from friends who had moved to Milwaukee, Wisconsin, and fallen in love with the local ice cream sensation, an ultra-smooth and velvety relative of gelato made with egg yolks. In the U.S. midwest, it’s an obsession. For the months and years that followed, I was subjected to a parade of mouthwatering flickr photos of creamy, dreamy cups of custard at various stages of sensual melty-ness (that’s a word, right?). But it wasn’t until I met Haley last week when she launched her roving business, that I actually had my first taste of frozen custard. It was last Saturday and the perfect afternoon for ice cream. 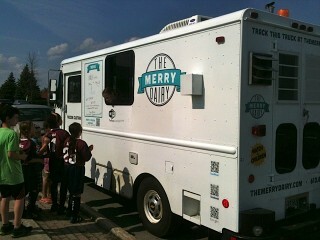 First I found The Merry Dairy on facebook which led me to the website that uses a GPS-enabled app. I clicked on the link “Track The Truck” which loaded a page with a little map that showed me exactly where to find Haley: Walkley and Conroy Rd. As it turns out she was camped out with her two kids at a soccer tournament in the Ottawa Business Park. I drove across town and finally spotted the bright white truck. As I approached, I heard the sweet old-fashioned ice cream-truck chimes playing “Let it Be”. I began to salivate. After years of a build-up of expectations, I confess my first lick was a little disappointing. It did not seem unlike other super premium ice cream and gelato I had tasted before. I had hoped it might be a whole new experience. But as I continued to eat it, I began to appreciate the subtle differences. I noticed a really nice clean, silky mouth-feel, and that it was not the least bit cloying or overly sweet. And it did taste really fresh and pure. It’s a great lesson in simplicity, too. No chunks, mix-ins, and other distractions — just the real creamy deal. For now it’s vanilla or bust; she may add another flavour or two over time. Haley does offer the option of a squirt of chocolate or caramel sauce or sprinkles on top but doesn’t plan to get caught up in any trendy bacon and Froot-Loops business. There are no nuts in the truck either. After a lineup of soccer players cleared, Haley invited me inside the truck where I saw the frozen custard machine that cranks out each batch of custard that gets transferred to the freezer where it awaits the chance to be scooped. Haley explains that frozen custard, like gelato, has a lower overrun than ice cream. Overrun refers to how much air gets incorporated into the product. So, frozen custard has 15-20% overrun compared to something that comes out of a traditional soft-serve machine, which could have an overrun of 60-80%. 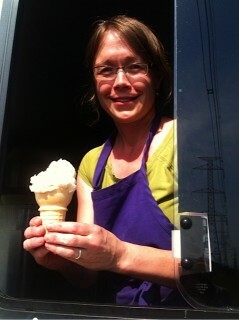 The butterfat content of Haley’s custard comes from 12% cream (vs. soft-serve which, she says, is about 5% butterfat). Combine that with the egg yolk, a natural emulsifier, and you get the recipe for frozen custard’s superior smooth creamy texture. So, to recap, frozen custard is softer than regular scoop ice cream but firmer than soft-serve and creamier than both. It is not stored inside the machine like soft-serve and it’s sold fresh the same day that it is made. Frozen custard is also served at a little warmer temperature, which increases the pleasure factor because your tastebuds will be less numb while you eat it.